I LOVE the way this looks on clothing. 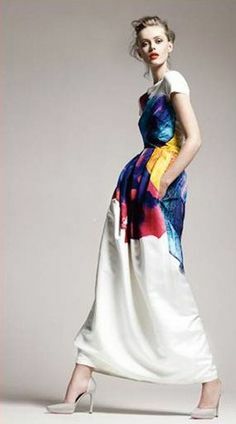 I've been on the hunt for a watercolour dress for spring since winter, and although I've seen some contenders. Some really break the bank or are just not my style. I think the watercolour trend is so chic and very trendy this season, not to mention it just screams spring! Do I sound excited yet? Well I am! This trend is one that I'm sure a lot of you will appreciate because it looks so delicate and feminine. Perfect for the season. I've seen some long dresses on the runway already and a lot of watercolour pants as well. I HAD to share this.